The time has come to brace ourselves for a lively and dynamic Year of the Tiger. And what better way to assuage our growling hunger for myriad Chinese New Year delights than to feast on Chef Ricky Thein's irresistible festive dishes. 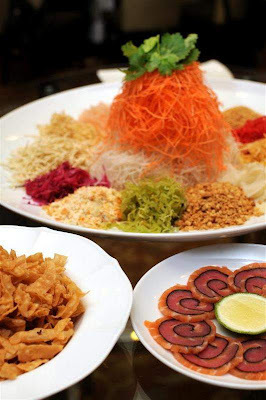 No CNY meal in Malaysia is ever complete without an auspicious platter of raw fish salad. At Tai Zi Heen, the tangy-sweet, colourful and multi-textural Ying Yang Yee Sang with Tuna and Salmon Roulade serves as the perfect curtain raiser to usher in a brand new year filled with high hopes of good fortune, great abundance and untold happiness. 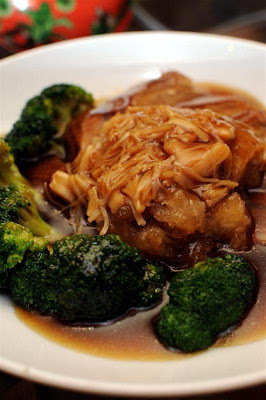 The chef's Midas touch is evident in the Braised Pearl Shark's Fin with Fish Maw in Supreme Golden Broth. Its seductively light yet creamy texture and brilliant golden yellow hue was derived from an ingenious combination of duck-based stock and carrot juice that had undergone 10 long hours of double-boiling under Chef Thein's watchful eyes. 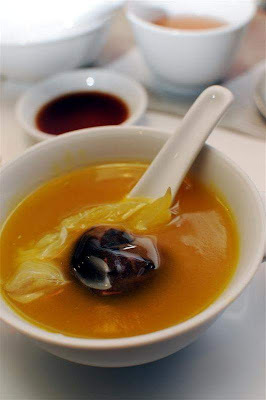 Coupled with the smooth and spongy fish maw and luxuriant comb of shark's fin, the soup is pure manna for the soul. Some traditional delicacies are best left untampered with. In the case of the ubiquitous ho see fatt choi or literally dried oyster and sea moss - two compulsory ingredients that no Lunar New Year dinner worth its salt can do without, I was delighted to find the chef managed to imbue a fresh dimension to Braised Dried Oysters with Sea Moss by incorporating succulent Mexican Soy Clams, toothsome Sea Cucumber and tender Wok-fried Greens into the classic dish. 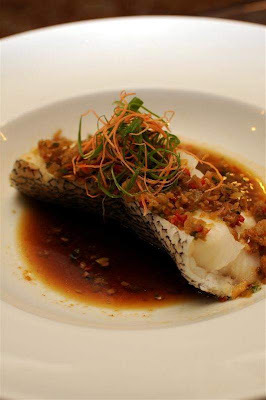 A long-forgotten rustic flavour emerged in the Steamed Cod with Pickled Radish and Garlic in Supreme Soy Sauce. 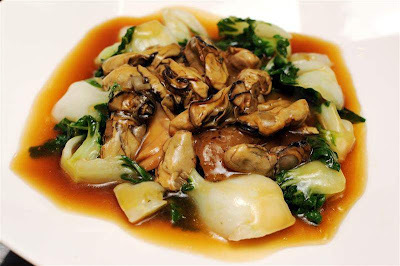 We were bowled over by the savoury and crunchy choy poh. Yes, that humble old-fashioned pickled radish favoured by grannies of yore to complement plain porridge, sprinkled into omelette and a 'must have' ingredient for the best char kway kark or fried radish cake. In this instance, it made a winsome topping together with the chopped red chilli and garlic for the alluringly rich and marble-smooth cod fillet. Raising the bar further was Deep-fried Batter-coated Prawns with Fresh Lime Dressing which saw the potent accent, juice and fragrance of kaffir lime being put to good use. 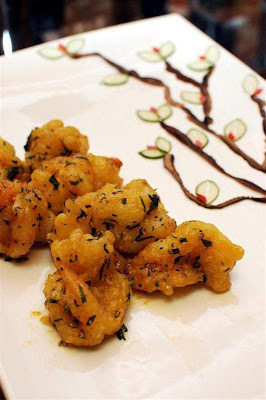 Springy to the bite, the springy prawns in their crisp batter coating were speckled with fine slivers of kaffir lime leaves and slicked with an aromatic, mildly sweet-citrusy dressing. Just when we thought nothing can possibly top that delectable speciality, along came the Braised Duck with Dried Fish Maw and Dried Scallops. So intent was everyone in savouring each and every morsel that all conversation came to a halt and one could almost hear a pin drop in the palpable silence that ensued. 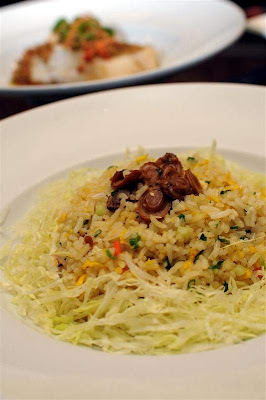 I have always enjoyed Chef Thein's delicious Fried Rice with Seafood and Baby Abalone and as expected, it manages to rise to the occasion. Fluffy and coated with strands of egg, the rice exudes great wok hei and comes with a handful of tender, finger nail-size baby abalone. 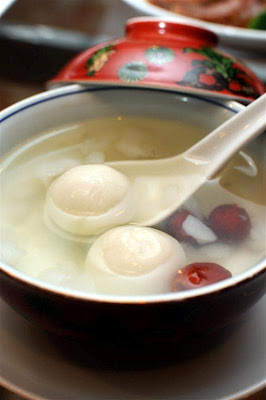 The dessert of Double-boiled Hasma with Red Dates and Glutinous Rice Dumplings caused a few of our dining companions to blanch when they were told hasma is in fact snow frogs' ovaries. After overcoming their initial hesitance, most gamely sampled the salubrious broth and vouched that the soft, cloudy and jelly-like clumps were quite agreeable after all. Ah, talk about earning one's stripes in the call of duty! Gong Xi Gong Xi! The Prosperity Set menus are priced from RM988++ onwards per table of 10 persons.